LF of America now offers a new automatic bottle filling and capping machine perfectly suited for handling cosmetics, OTC pharmaceuticals, and other liquid products. The Bellow Bottle Machine is a bottle filling and automatic capping system designed for packaging liquids in plastic containers with caps. It’s cost-effective operating costs, diverse functionality, and impressive efficiency makes our featured bottle filling and capping machine a one-of-a-kind packaging solution. For more details, continue reading the article below and watch the video provided of the filling and capping machine during production. 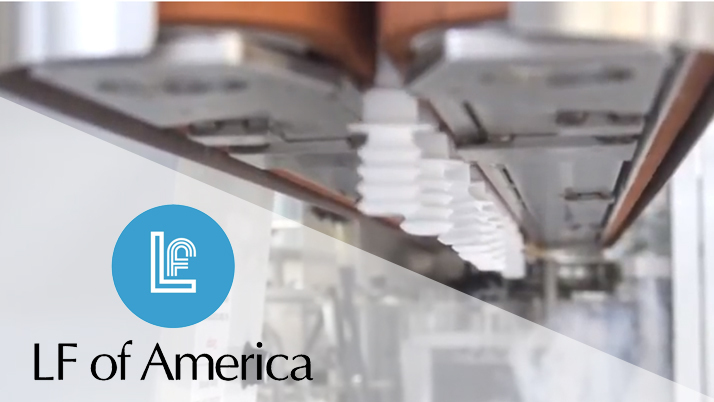 For immediate assistance, contact LF of America today to further discuss the benefits of implementing our new bottle filling system into your business’ current lineup. Our featured bottle filling and capping machine is capable of automatically packaging different liquid viscosities (gels, liquid serums, creams, powders, and more) into numerous plastic container designs, styles, and volume sizes. When running at full-size production capacity, the liquid filling and bottle capping system can fill as many as 1,500 containers per hour (or 25 containers per minute). Once the filling and capping process is initiated, the containers from the vibratory feeder are sourced to a starwheel while a second feeder begins moving the caps to the opposite side of the system. Then, using a piston filling process, the product is filled into the containers before being aligned for capping. When the capping process is complete, the filled units are loaded onto a conveyor where they can then be prepped for coding. The Bellows Bottle Machine is an automatic bottle filling and capping machine uniquely designed to handle a specialized container – Bellow Bottles. Our unique bellows packaging is a multi-purpose plastic container engineered to handle serums, creams, various liquid viscosities, and can even be altered to hold powders. The Bellow Bottle container comes in different package sizes, ranging from a small volume size of 3 mL up to larger volume sizes as high as 9 mL. To add more diversity to the bottle’s intended uses, there are also short and long cannula size options, along with various caps and applicators to choose from. Manufactured using high-grade materials that are both durable and resistant, the Bellow Bottle can be ordered in various custom color combinations (including different colors for each bottle, cannula, applicator, and cap). Ready to save money on outsourcing contract filling and sealing services and develop an in-house packaging strategy? Invest in an automatic filling and capping machine and prepare your business to handle continued growth and success. To buy bottle filling and capping machine units for sale, call LF of America at 561-988-0303. Contact our team if you need more information about our filling and capping systems or have any other questions.